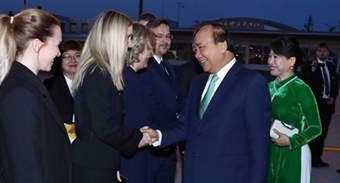 PSNews - Senior Lieutenant General Nguyen Van Thanh, Member of Party Central Committee, Deputy Minister of Pubic Security, on March 26 led a delegation of the Ministry of Public Security (MPS) to work with the Binh Phuoc Provincial Police. PSNews - On the occasion of the 88th Anniversary of the Ho Chi Minh Communist Party (March 26, 1931 – 2019), the Youth Union Chapters of the Force Building Division and Traffic Police Division under Ha Nam Provincial Police Department co-hosted a dissemination drive on the Traffic Law and traffic safety regulations for students and teachers of Liem Can Secondary School, Thanh Liem District, Ha Nam. PSNews - The Youth Unions of Hospital 198 and the Department of Telecommunications and Cipher under the Ministry of Public Security on March 22 offered incense and flowers in commemoration of President Ho Chi Minh at the Memorial Site of Uncle Ho's Six Teachings to the Public Security Forces. PSNews – The traffic police force of Quang Tri was deployed to key routes and localities to support the local veterinary force functional units in checking transport vehicles to prevent the spread of African swine fever. PSNews – The member units of Emulation Grouping 7 under the Ministry of Public Security (MPS) on March 20 held a ceremony in Hanoi to sign a mutual emulation agreement and launch the emulation movement “For National Security” in 2019. PSNews - After the Traditional New Year Festival, under the direction of the leaders of the Provincial Police, units under the Provincial Police of Ha Tinh promoted their relations with people at the grassroots level so as to soon respond to their questions and better serve them. PSNews - Although relevant local agencies strictly punished unlicensed and illegal mining in Phu Quoc, Kien Giang, the situation still remained complex, negatively affecting the natural resources as well as security and order in the locality. PSNews - Emulation Grouping 1 under the Ministry of Public Security (MPS) on March 19 organized a ceremony to sign a mutual emulation agreement in 2019. PSNews – Doctors of the Health Department and Hospital 198 under the Ministry of Public Security on March 15 provided free health checkups for 200 poor people and elderly people in Vu Ban district, Nam Dinh province. PSNews – The Tan Son Nhat International Airport Police Station on March 19 in collaboration with the Long An Provincial Police and Long An province’s Duc Hue district authorities handed 200 gifts, worth 120 million VND in total, to local policy beneficiaries and poor students. PSNews -The 48th Asia Region Law Enforcement Management Program (ARLEMP 48) on March 19 opened at RMIT Ha Noi. PSNews - A high-ranking delegation of the Vietnamese Government led by LieutenantGeneral Nguyen Van Son, Deputy Minister of Public Security, on March 14 – 15 attended a high-level meeting of the 62nd session of the United Nations Commission on Narcotic Drugs in Vienna (Austria). PSNews - The Youth Union Chapter of the Thua Thien Hue police on March 17 organized an outdoor activity cleaning up the Huong river in response to the program "Green Sunday" initiated by the Provincial People's Committee. PSNews - The Department for Information and Communications under the Ministry of Public Security (MPS) on March 18 held a ceremony to announce a decision signed by the Minister of Public Security on the establishment of the Steering Committee and Drafting Team to draw up a project on the public security press and media. PSNews – The Youth Union Chapter of the Public Security Department for Information and Communications on March 15 in coordination with People’s Police College 2 held a seminar on “Improving the political and ideological stance and promoting the role of public security youths in information dissemination”. PSNews - In order to halt the spreading of the African swine fever (ASF), the Ministry of Public Security has directed the police units in southern provinces to set up checkpoints at the gateway to each locality. The Bac Lieu Provincial Police, on March 12, hosted a ceremony to launch a task force police unit for patrolling on key routes and preventing violations and crimes (also called Police Unit 238). PSNews - During 2 days, a working team of the Division of Administrative Management of Social Order under the Thanh Hoa Provincial Police Department issued new or renewed ID cards for 355 people. PSNews - The Ministry of Public Security (MPS) organized a conference on March 12 to review the fight against corruption within the Public Security Forces in 2018. The conference was chaired by General To Lam, Politburo Member, Minister of Public Security, and Head of the Anti-corruption Steering Committee of the MPS. PSNews - General To Lam, Minister of Public Security, on March 12 in Hanoi, hosted a meeting with the a delegation of the US – ASEAN Business Council (USABC) led by Mr. Alexander Feldman, President and CEO of the USABC and Mr. Michael Michalak, Senior Vice President and Regional Managing Director of USABC.